We introduce natural strategic games on graphs, which capture the idea of coordination in a local setting. We study the existence of equilibria that are resilient to coalitional deviations of unbounded and bounded size (i.e., strong equilibria and k-equilibria respectively). We show that pure Nash equilibria and 2-equilibria exist, and give an example in which no 3-equilibrium exists. Moreover, we prove that strong equilibria exist for various special cases. We also study the price of anarchy (PoA) and price of stability (PoS) for these solution concepts. 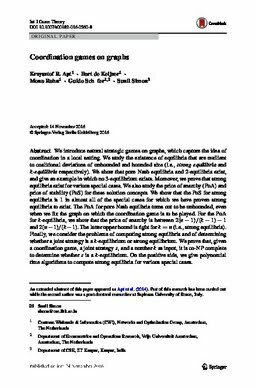 We show that the PoS for strong equilibria is 1 in almost all of the special cases for which we have proven strong equilibria to exist. The PoA for pure Nash equilbria turns out to be unbounded, even when we fix the graph on which the coordination game is to be played. For the PoA for k-equilibria, we show that the price of anarchy is between (Formula presented.) and (Formula presented.). The latter upper bound is tight for (Formula presented.) (i.e., strong equilibria). Finally, we consider the problems of computing strong equilibria and of determining whether a joint strategy is a k-equilibrium or strong equilibrium. We prove that, given a coordination game, a joint strategy s, and a number k as input, it is co-NP complete to determine whether s is a k-equilibrium. On the positive side, we give polynomial time algorithms to compute strong equilibria for various special cases.